For the Sega Mega Drive game, see Gauntlet IV. 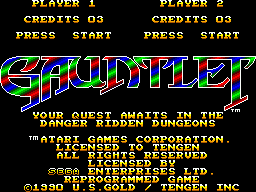 Gauntlet is a 1985 arcade game developed by Atari Games. A port to the Sega Master System developed by Tiertex Design Studios and published by U.S. Gold was released in 1990 in Europe only. The arcade game allowed up to four players, but like many home conversions the Sega Master System version only allows up to two players. Tengen announced a Sega Mega Drive version for release in 1992, going so far as to create prototypes its own four-player adapters, set to be included with the game. This version was released as Gauntlet IV and was compatible with both Sega's Team Player (which is the adapter designed by Tengen) and Electronic Arts' 4 Way Play accessories. Gauntlet combines arcade-style gameplay with the theme and dungeon-crawling action of pen and paper role-playing games like Dungeons & Dragons. The players fight their way through many floors of an enormous dungeon, both cooperating to kill enemies and competing to collect gold and upgrades. Players can choose from among four characters (Thor the Warrior, Thyra the Valkyrie, Merlin the Wizard or Questor the Elf). Each has their own unique visual appearance and various strengths and weaknesses (for example, Merlin excels at magic but his hand-to-hand attacks are weak). The game's huge success in the arcades led to a large number of home ports and various sequels, but the series didn't return to Sega systems until the Sega Mega Drive-exclusive Gauntlet IV in 1993; unlike the first game, Gauntlet IV was released in the US and Japan as well as Europe.